The blog is back online, but little else on the line. A major problem for the hosts of this blog, saw the data from 1.7 million site owners wiped out over night, when a software script supposed to update the system went into delete mode instead. A 24/7 recovery program was put in place, which saw this blog back online in 14 days. Others are still waiting. To celebrate, I gathered up my flyfishing gear and headed out to my local trout stream in search of a blog. I was not too optimistic, as the weather of late has been very cold with unseasonal snow showers sweeping across the country, my fears were confirmed looking up at a troubled sky, as I entered the fishery gate. With a new 7 ft 4 WT rod, reel and line to test out, conditions were not ideal, a gusting, icy wind ruffling the surface of the river, which despite the heavy rains was running fast, but clear. Ignoring the first half a mile of bank, I set off toward a deep pool at the head for an S bend, only to find the downstream wind made casting up into it difficult, while dragging the line back at twice the speed of the current. On the way to the pool it was evident that the farmer had been busy over the winter months, erecting new fences and more importantly for me, carving out a new track through what had been an impenetrable blackthorn copse, opening up new pastures bounded by the river. 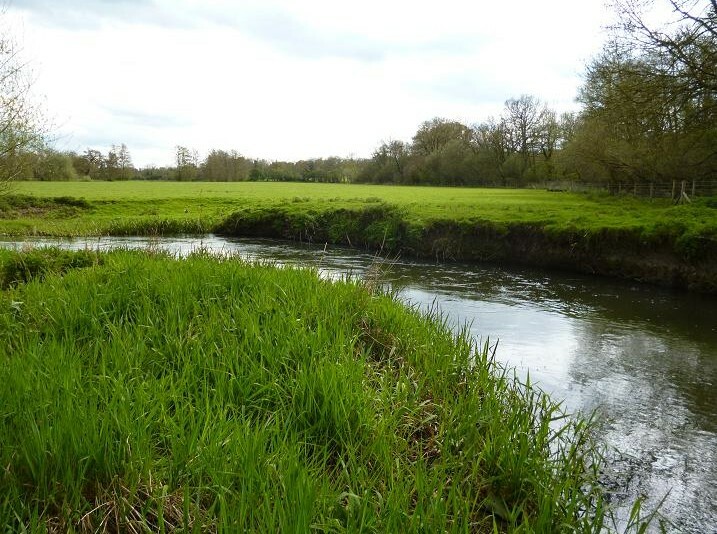 A hundred yards down from the copse, the bank was clear, ideal for casting the fly, this deep pool being one of several now available to fish, thanks to the new track. 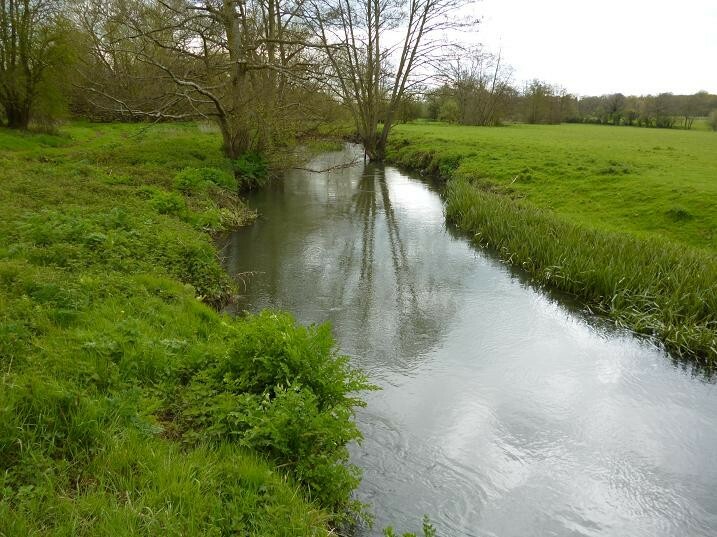 The potential for this part of the fishery is obvious, although it is not stocked, some decent trout populate the river naturally and I look forward to returning, when the mayfly are on the wing. My size 18 goldhead GRHE was ignored on this occasion, but the calling of a cuckoo and the sight of a group of rare nuthatches made up for the lack of fish. Fresh from Africa, swallows and martins flitted across the meadow in the chill wind seeking out the sparse fly life. Cutting across the meadow, I walked as far as a new boundary, where the way was barred by another thicket of blackthorn, then picked my way back up the river, drifting the nymph unmolested through a variety of tree lined pools. Out of the trees the river took a right turn, running deep beneath the bank and I worked my way upstream, allowing the nymph to fall back into the slacker water. This looked perfect for fish, but not until in the crease of a back eddy did the line dive against the flow and I lifted into a gold flanked brown, that cartwheeled over the surface to fall back and swim free seconds later. Elation turned to disbelief and I checked the tiny hook, but it was sharp enough. Spurred on, I continued my way back along the bank, searching out the pools without success, until the clouds darkened and I was forced to take cover beneath an old willow, while sleet and hail rattled through the branches. Crunching through frozen hail on my way back to the van, it was hard to believe that Sunday is the 1st of May. Losing the battle against the fast breeding rabbits at the equestrian centre, I was back again a few days later, when the storm showers held off long enough to give a warm sun filled afternoon. 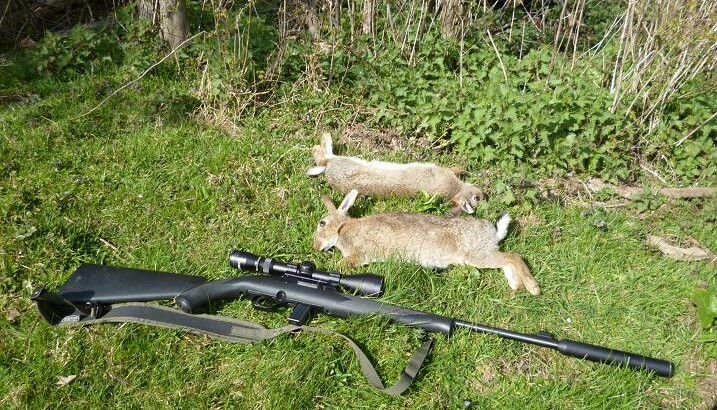 A dozen years ago, when I first asked for permission to shoot at this 80 acre site, set among the urban sprawl of a large town, the rabbits were everywhere and using only an air rifle was able to harvest about a twenty a week. Living only a mile away, my visits were many, resulting in a visible difference over the first season and a shortage of close range targets afterwards. Upgrading to a more powerful air rifle, a Career 707 .22, then the Magtech 7002 .22 semi auto rim fire, I was able to keep the numbers in check and the landowner happy, but now following a mild wet winter the rabbits have returned and the owner is not a happy man. The main concern is rabbits burrowing out into the many rides, which criss cross the centre, posing a hazard to the horse riders and their animals, most of these rides edged by wide ancient hedgerows, the ideal habitat for wildlife including pheasants and muntjack deer. 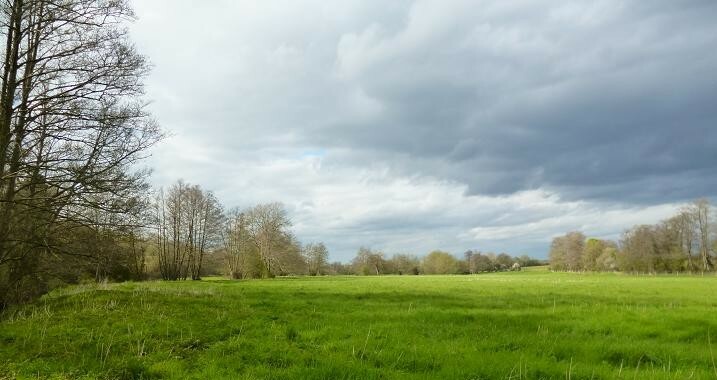 Having concentrated on the wood recently, I set out toward the open paddocks in the middle of the acreage, where a gorse bordered stream bisects the property. Rounding a corner, I could see rabbits cantering about over a hundred yards away and keeping down below the curve of the field, I was able to approach the ride unseen, shinning up the slope of the ride to see four or five sitting out in the sun 60-70 yards away. Opening out the scope to maximum 9 mag, one was broadside on and aimed a rested chest shot at it, surprising, but not scattering the rest, bringing the sights to bare on the next, which also slumped over. Two in two seconds. The rest melted back beneath the gorse. I waited for ten minutes, just in case others came out again, often they will just bob out for a few seconds for a look see, but this time not, although as I lay there, another pair crossed the rise at the end of the ride. Bagging these two, I moved with caution toward the copse ahead, seeing another at the edge of the next ride and got down for a prone shot, knocking it over at 40 yards. Following down the ride I spotted a very young kit in the undergrowth, but held off as the next curve in the hedge has been home to many rabbits in the past. Crawling close to the hedge, I could see the brown shapes of more rabbits through the branches and pushed by bag ahead of me to act as a rest, having a clear view, when I rested the rifle for two rapid shots, that accounted for another pair. 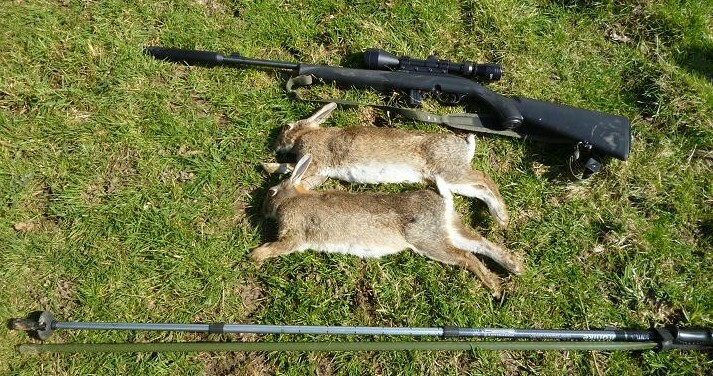 The sun was now quite hot and I stripped off my jacket while I cleaned this pair, pausing in my labours to see another rabbit sitting out in the sun only 30 yards away at the edge of a ditch. Slowly reaching for the Magtech, I brought it up to my eye and shot number six. This young buck jumped around when shot and needed a quick second stopper, as it was close to falling down into the stream. This was enough for me now, as I was already sweating from skinning the other two, the whole lot having to be carried back to the van. On the way back, rounding the curve more rabbits were feeding on the ride. I could not ignore these and the rifle was swung into the fork of my sticks for a firm 50 yard shot at an unsuspecting target, slumping it forward. The rest scattered, but a pair had been feeding unseen in the adjacent paddock and now ran back, stopping one of them as it slowed for the fence. More work, more weight to lug back. My shooting bag was full, so these once cleaned, were wrapped in a plastic shopping bag and stowed in the poacher’s pocket across the rear of my jacket. 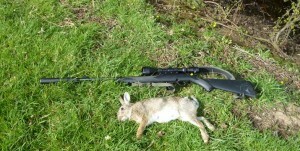 It was a long hard walk to the van at the stables, the shooting sticks at least aiding progress over the rough ground. 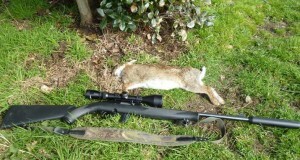 As I walked, rabbits were silhouetted against the skyline along the southern boundary. 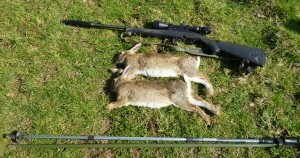 I may have to bring the HMR next time to sort them out.